Posted in: 5 TV Tales. Tagged: American Idol, Crystal Bowersox, Lee Dewyze. Lee Dewyze is the new American Idol! 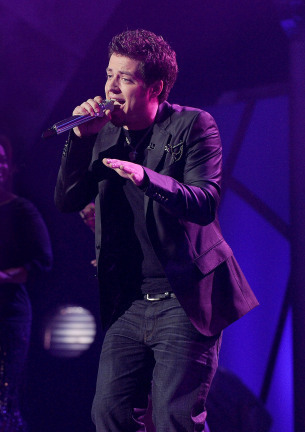 Lee Dewyze, the paint store clerk from Mount Prospect, Illinois, bucked all odds and was named winner of American Idol Season 9. In the process, he edged out strong favorite Crystal Bowersox by a very close 2% in the votes to succeed last season’s Kris Allen and complete an upset victory. This despite the fact that he did not perform as well as Bowersox during the performance finale last night. “I have never been happier in my life,” said an emotional DeWyze, who worked in a Chicago paint shop before auditioning for the Fox TV singing contest a year ago. DeWyze’s cover version of U2’s hit “Beautiful Day” will be released as his first single. His debut album, on a Sony Music Entertainment record label, will likely follow in the fall.